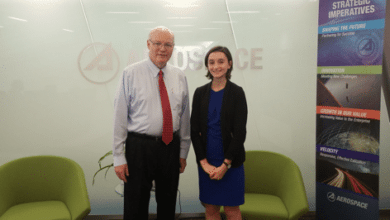 Anna Lulushi and Ed Swallow of The Aerospace Corp.
Anna Lulushi graduated last June from Thomas Jefferson High School for Science and Technology in Alexandria, Virginia. WashingtonExec first met up with Lulushi, a Nysmith School alum, when she spoke at the March K-12 STEM Symposium. Now, with the symposium — and her high school career — in the rear-view mirror, Lulushi, who started at Carnegie Mellon University at the end of August, reflects on her time at TJ (yes, the prestigious science-and-tech-focused school has a dedicated drama department), the new skills she’s learned from her internship with The Aerospace Corp. (research she’s working on now could help humans explore Mars in the future) and how she became a STEM mentor, herself. WashingtonExec: You graduated from TJ in June and are now attending Carnegie Mellon University. How was the end of school for you? Anything exciting happen after the K-12 STEM Symposium? Lulushi: The end of the school year was a bit of a whirlwind. TJStar (TJ’s annual research symposium), final exams and graduation all happened with the span of a few weeks. Because of my position on the class council, I spoke at graduation about our class gift: an inflatable photo booth to be used at future TJ events. After graduation, I went to the Outer Banks for a week with a small group of my closest friends to bond one last time. When I came back, I was very excited to start my internship at The Aerospace Corp.
WashingtonExec: For the STEM Symposium, you and Dr. Ann Bonitatibus emphasized making TJ “just like any other high school” as well as renewing focus on mental health and wellness. Did you see a shift in the culture of TJ over your four years? Lulushi: I’m speaking from my experience. I was a member of the student government at TJ, interacting with both students and administrators. I was also on the TJ women’s lacrosse team and involved in theater. Each student’s time at TJ is different and ultimately, TJ is what you make of it. Reflecting on my experience at TJ, I would like to see a reduction in the focus on grades and scores as sole measures of success. In many ways, I saw students working to make this happen over the past four years, but I believe there is room for improvement in this area. During my time on the lacrosse team, we grew from not winning any games to having our best season in four years this past spring. Part of this was due to the change in coaching staff that we had, but a large part of it came from the dedication of our players. We practiced in every kind of weather, from snow to rain to 20 mph winds. A lot of other people would not have been able to sustain practice in those conditions, on top of regular amounts of schoolwork for TJ. But we did, and that’s why we were so successful this year. Athletes at TJ are some of the most driven people, often trying to be the best both in their sport and in their classes. The same is true for the drama department at TJ, which I saw grow nearly exponentially from my freshman year. In the past two years, there have been over 100 people involved in our spring musicals, fulfilling roles such as actors, techs and musicians (with some people in more than one role). Members of the TJ drama community dedicate themselves fully to each production, with rehearsals every night (which can go past 10 p.m. on occasion) as well as build days on the weekends that sometimes last all day. It has always been incredible to me that, in a challenging STEM school, students are as dedicated to the arts and athletics as they are to their schoolwork, if not more. I hope that the TJ student body will continue to emphasize a balanced approach to academics, athletics and fine arts. WashingtonExec: Now that you are officially a graduate, what advice would you give your younger self? Lulushi: Relax a bit. Exhale every once in a while. Everyone who goes to TJ ends up successful, regardless of where they go to college. During my time at TJ, I learned that I’m able to learn better and retain more information when I’m not stressed out and when I give myself time to breathe. I’d also encourage myself to manage my time better — although this is something that can only really be learned through experience and after too many late-night study sessions. WashingtonExec: This summer, you are interning at The Aerospace Corp. What are you working on this summer and what are you learning? Any fun field trips or projects you have been a part of? Soft skills? Technical skills? Lulushi: This summer, I’m working on two projects at Aerospace within the Civil Systems Group in Crystal City. My main work is in systems integration and protection to create more intuitive visualizations of satellite telemetry data using an analytics tool called Tableau. I hadn’t heard of Tableau before coming to Aerospace, so I was really excited to get working knowledge and hands-on experience with it. It’s a really powerful tool, especially for handling big data. It’s really intuitive, and I was able to pick it up quickly. I’ve also been able to refine my Python skills, as some of our preprocessing has to be done in Python before the data is used in Tableau. It’s really interesting work, and I’m planning to continue working for Aerospace part-time in the fall after I get settled in at Carnegie Mellon. The second project is one I’m working on with all of the CSG interns, including those at the Goddard and El Segundo offices. We’re designing next-generation infrastructure for long-term sorties and outposts both on the moon and on Mars. My task focuses specifically on communications systems for Mars orbiters. This project has been great for the information that I’ve learned, as well as building my communication and leadership skills. Overall, I’ve loved my time at Aerospace and I’ve definitely gained a lot of valuable skills that I’ll carry with me to college. WashingtonExec: Do you consider yourself a STEM mentor and how have STEM mentors impacted you in your academic and/or career goals? Lulushi: Yeah, although I still have a lot to learn myself. But I think that having gone through TJ, I’ve learned enough about what it takes to be successful in STEM classes to be able to help younger students. In past summers, I’ve volunteered through TJ’s STEMbassadors program to tutor middle school kids in math. I’ve received a lot of guidance from many of the amazing teachers at TJ. Aside from just academic knowledge, I’ve learned how to think critically, evaluate sources and work from the ground up to devise solutions to complex problems. Because I’ve always felt supported by these mentors, I’ve never been too afraid to step out of my comfort zone and try something new. I was able to do a lot of exploring through my courses at TJ, from subjects like computer science to neurobiology. This fostered an interdisciplinary attitude that I retain to this day. WashingtonExec: Any books on your summer reading list? Lulushi: This summer, I’ve been catching up on books I’ve always wanted to read but hadn’t gotten around to yet. The commute to Crystal City has been great for that. I have around an hour and a half of dedicated reading time every day on the Metro. I recently finished “The Idiot” by Fyodor Dostoyevsky, which I think will go down as one of my all-time favorite books. I also read “Circe” by Madeline Miller, which is a retelling of multiple Greek myths woven together. I loved this book as well, both for the familiarity it offered me (I grew up reading Greek mythology) and for the modern twist Miller put on traditional stories.